On a rainy morning in August, dozens of men and women crowded into the tiny church in the farming community of El Carmen de la Frontera, in the mountains of northern Peru. Foremost among their worries was a mining company prospecting for copper high in the cloud forest near the border with Ecuador. The farmers feared that the mine would cut off water supplies to their crops, or affect the certification of the shade-grown organic coffee that they grow for export. A month later, they voted overwhelmingly against allowing mining in their district. As international metals prices rise, the Andes have become a prime target for investment by foreign companies. Communities often fight back, fearing that open-pit mines will pollute their water and land. In many places, church workers are on the front line in efforts to stem environmental destruction. That makes them targets of both corporations and government officials eager to cash in on the bonanza. In Chulucanas diocese in northern Peru, Bishop Daniel Turley, a Chicago-born Augustinian missionary, found himself on the firing line for defending the right of farmers to speak out about mining. Protests over a planned open-pit mine in an area reputed to have a rich deposit of copper and molybdenum claimed two lives in 2004, and emotions were running high as three districts prepared for a non-binding referendum on mining that was held Sept. 16. Members of the diocesan Justice and Peace Commission visited villages, not telling people how to vote, but explaining how the referendum would work and encouraging residents to participate. “As bishop, I stand for dialogue, not violence, but I am afraid there may be violence,” Turley told NCR a month before the vote. Shortly before the referendum, Turley received threatening telephone calls that led the U.S. Conference of Catholic Bishops to send a letter to its Peruvian counterpart, expressing concern. The balloting was peaceful, however, as voters overwhelmingly opposed the proposed mining district, which community leaders are afraid would foul the headwaters of several rivers in a fragile cloud forest ecosystem. Theirs will probably not be the last word, however. With copper prices so high that there is a brisk black market in the country for stolen telephone cables, García’s government will almost certainly continue to court the $1.44 billion Rio Blanco project proposed by Monterrico Metals, a London-based company that recently sold an 80-percent stake to the Chinese-owned Zijin consortium. If built, the mine would be one of the world’s 20 largest copper mines. It would join other large-scale mining operations in Peru owned by companies such as Denver-based Newmont Mining Corp., Toronto-based Barrick Gold Corp. and Switzerland’s Xstrata. Government officials say that mining, which has largely driven Peru’s economic growth in recent years, is crucial to the country’s development, and companies are often eligible for large tax breaks. Critics, meanwhile, point out that the remote Andean highlands where most mines are located continue to have the country’s highest poverty rates. Peru’s bishops are not united on environmental issues, but Turley, Jesuit Archbishop Pedro Barreto of Huancayo in the central highlands, and Dominican Bishop Francisco González of Puerto Maldonado in the Amazon basin in southeastern Peru have taken an increasingly public stand on industries that they say have little regard for the health and welfare of surrounding communities. In Barreto’s archdiocese, church workers have been threatened for their efforts to pressure Doe Run Peru, a subsidiary of the U.S.-based Renco Group, to clean up pollution from a smelter that has caused extensive lead poisoning among residents, especially children, in La Oroya, one of the 10 most polluted places on the planet, according to the Blacksmith Institute of New York. In some cases, dialogue groups have been set up to help break impasses between mining companies and communities, but results have been mixed. Efforts at dialogue about the problem of the smelter in La Oroya have not brought the results that activists had hoped. But Barreto is hopeful that the broad-based coalition that has formed to clean up the Mantaro River valley will succeed because it is led by civic groups, rather than government agencies. More recently, talks about the Majaz mine near Huancabamba broke down when the government refused the local mayor’s request that the Sept. 16 referendum be one of the points on the agenda. Barreto arranged for a study by the St. Louis University School of Public Health, which found that most of the children in the neighborhood nearest the La Oroya smelter had high levels of lead, cadmium and other metals in their blood. The archdiocese is spearheading a project to clean up the Mantaro River, which runs through Huancayo and La Oroya. The project involves community-based monitoring of air, water and soil samples. 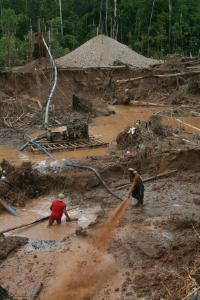 On the eastern side of the Andes, in the southeastern Peruvian department of Madre de Dios, miners are blasting away huge swaths of jungle with high-pressure hoses and using backhoes and dump trucks to move thousands of tons of soil, destroying the fragile and biologically diverse ecosystem and silting up rivers in search of gold. According to government statistics, Madre de Dios produces 15 tons of gold a year, but the real figure may be as much as twice that amount, because many of the mines are informal -- not subject to environmental, labor or safety regulations, and not paying taxes that could be used for environmental protection. While Barreto, Turley and González are speaking out on environmental issues, however, the Peruvian Conference of Bishops has been more reticent. Barreto said the issue is a challenge for the church hierarchy. Large-scale open-pit mines that process thousands of tons of ore, chewing away mountains and raising the specter of long-term acid drainage, have drawn fire from church workers and environmentalists from Guatemala and Costa Rica in Central America to the Andean countries and Chile in South. In Oruro, Bolivia, on the high flat plain known as the Altiplano, Br. Gilberto Pauwels, a Belgian Oblate of Mary Immaculate, is monitoring two mines -- one in full production and one that is being closed down -- owned by Denver-based Newmont Mining Corp.
At the Center for Ecology and Andean Peoples (CEPA, for its Spanish initials), an environmental education and research organization in Oruro, Pauwels points to satellite photos that show a decrease in the flow of the Desaguadero River after the first mine opened. Researchers at the center, which Pauwels founded, say the mine has sucked water from the river, raising the salt content of the surrounding land. Even before the Spaniards arrived in South America, Oruro was a mining area. Claims have been staked around the town, even within the city limits. “We know that all of these hills contain gold, but [mining] can’t be permitted within the city,” Pauwels said. Nevertheless, Inti Raymi, a company in which Newmont is the majority stakeholder, has opened a $24 million mine within the city limits. The concession overlaps a wetland that has been designated a Ramsar site, a classification that gives it international recognition but no official protection. CEPA has purchased land nearby, partly to monitor water quality and mainly to open an environmental, cultural and interreligious spirituality center where people can learn about organic farming and living in a way that will leave a smaller ecological footprint. It seems a small line of defense against the nearby mine, where heavy machinery has already chewed away a mountain and giant dump trucks carry ore from a huge gash in the earth. Nevertheless, Pauwels and his Bolivian colleagues at CEPA are steadfast in their defense of the environment, part of a church movement that is quietly growing throughout Latin America. 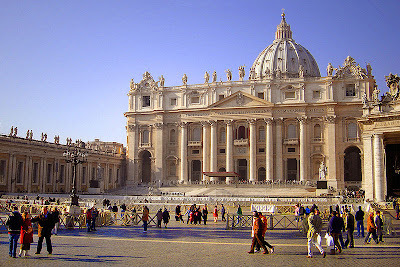 Brazil’s bishops and a handful of others raised the issue at the Fifth General Conference of Bishops of Latin America and the Caribbean in Aparecida, Brazil, in May, and the environment was included among the priorities outlined in the meeting’s final document. Barbara Fraser is a freelance writer living in Peru.